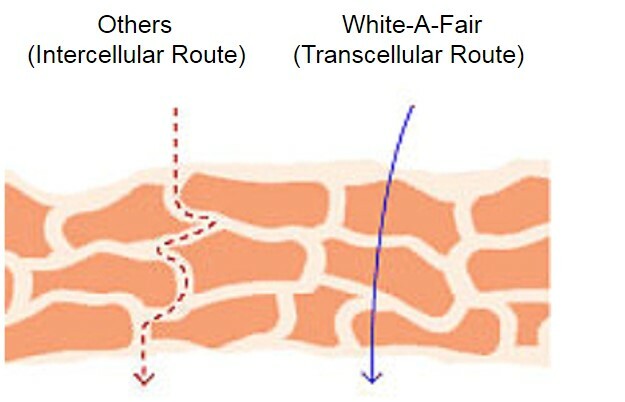 White-A-Fair uses advanced micro-Biotechnology, it is the evolutionary vitro process of using probiotic to digest the nutrients in the soy into small and easily absorb molecules. It is the employment of 7 combination bacteria strains to release the most nutrient from soy and further obtain the metabolism derivatives that are essential for beautiful skin. People who have constipation often have had skin condition. The reason is that the food they taken cannot be converted into enough utilizable molecules, so nutrient are only enough to provide energy to essential organs, like heart and lung, but not reaching our skin. Based on the theory upon, we digest the soy outside the body to obtain utilizable nutrients, and directly apply from outside. With the abundant nutrients, it helps the skin renewal and generates collagen efficiently. Also, the probiotic can produce some natural anti-germ substance which help kills the harmful bacteria on skin. Another reason for utilizing Soy derivatives is to provide the source of ingredient that is free from chemical synthesis. Most of the skincare ingredients utilize extract from plants, herbs, and animal extract like placenta, collagen and protein. They are subject to pollution, pesticide, heavy metal as well as diseases and viruses. Soy Yogurt Filtrate microbial-nutrients are produce under 10,000 class clean environment. They are safe, active and highly permeable wthin dermis.